Microsoft Office Clipboard allows you to collect and paste multiple items. For instance, you can copy a drawing object in Excel, switch to PowerPoint and copy a bulleted list, switch to Internet Explorer and copy a page of text, and then switch to Word and paste all the copied items. 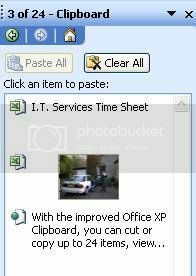 But, if you’re not comfortable with the clipboard then here’s a way to disable Microsoft Office Clipboard. Click Start, and then click Run. Type regedit and click OK.
Go to Edit> New> DWORD Value. With New Value #1 selected, type AcbControl, and hit ENTER. On the Edit menu, click Modify. In the Edit DWORD Value dialog box, click Decimal under Base. Type 1 in the Value data box. Click OK and quit the Registry Editor.